cubatravel has been a member since February 27th 2014, and has created 5 posts from scratch. The Cayo Blancos are two islands off the north Coast of Cuba pertaining to Matanzas Province Cuba. They are Called Cayo Blancos because they are really two islands one is called Hijo de Cayo Blanco (son of Cayo Blanco) and the other just Cayo Blanco. Both Islands will soon be developed for tourism with Cuba’s tourism authorities searching for investors to grow its appeal with Hotels and Resorts. The islands are currently popular places to visit on Varadero Catamaran Cruises and can be seen from the Varadero coastline. The Cayo Blancos are located in the very start of the Jardines del Rey Archipelago and, as such are protected from the northerly weather systems. The catamaran tour can be booked from any hotel Varadero, just ask at the front desk or contact our chat staff on this website. You are collected from your from hotel and transported by bus to Chapellin marina , about 5 minutes walk from Beaches Hotel, where you board the Catamaran. Tags: Catamaran Excursion, Cayo Blanco Catamaran, Cayo Blanco coordinates, Cayo Blanco de Sur Cuba, Cayo Blanco del Sur in Cuba, Cayo Blanco del Sur information, Cayo Blanco Facts, Cayo Blanco Tours, Cayo Blanco Varadero Guide, Cuba Travel Guide Cayo Blanco del Sur, location Cayo Blanco Cuba, where are the Cayo Blancos ? Cuba Hotels by destination is offered exclusively from the Cuba Cayo Blancos team at Travelucion. Browse Cuban hotels by category, price or read Cuban Hotel Reviews. Travelucion also offers independent reviews on over 400 Casa particular in Cuba all accessible from the links below and conveniently situated in each Cuban province. Cayo Blanco has been geared up for tourism and features a dock, washrooms and a bar. There is no accommodation on Cayo Blanco yet but it is only a matter of time. 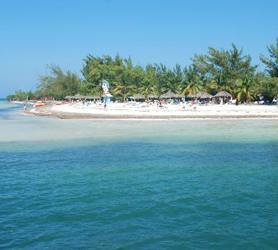 The island sees several boat excursions per day, primarily from the Hotels in Varadero. 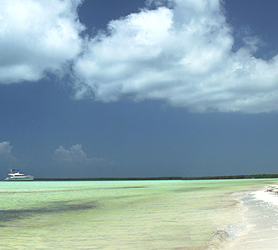 An all-inclusive maritime cruise takes you by Catamaran to Cayo Blanco from Varadero. You sail off-shore and enjoy swimming and snorkeling the beauty of the crystal clear waters around the Cuban Hicacos peninsula. Cayo Blanco is the venue for a delicious seafood lunch of locally caught lobster, shrimps, and fish. The tour features an Open bar on board of the comfortable vessels as well as during your stay on Cayo Blanco. Is the second island and much smaller than Cayo Blanco. 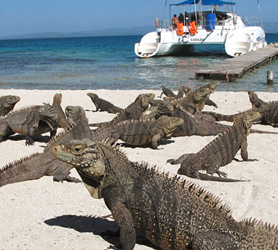 However, day trips to the island from Varadero are common and it is equally populated with 1000s of Iguanas like its bigger brother Cayo Blanco. In fact, many people end up on Cayo Hijo de Cayo Blanco thinking they are actually on Cayo Blanco. The island has less tourism infrastructure and is essentially half covered in foliage and trees. Cayo Hijo de Cayo Blanco is perfect for snorkeling and is essentially a virgin island with little in the way of services. Welcome to Cayo Blancos. Our website offers links to official national Travel Guides covering the cities, towns and major tourism destinations in Cuba. We offer comprehensive information concerning Cuba for those looking to learn more about the country for either touristic or academic study. Below is a list of our currently active Cuba Travel Guides, we will be releasing many more Cuba websites over the coming months so please come back soon to see the updated list.